Difference between revisions of "Laos"
Laos is a small, landlocked country in Southeast Asia. [[Mennonite Central Committee (International)|Mennonite Central Committee ]] (MCC) placed its first representatives in the capital city of Vientiane in 1975. This was a time of uncertainty and transition, since Laos had just been through a major war and had suffered intense bombing by the [[United States of America|United States]]. Early MCC assistance to Laos focused on increasing food production and helping displaced families resettle in their home villages. In 1981 MCC shifted its focus to village level, locally sustainable education and health programs. MCC also began working with officials of the heavily bombed province of Xieng Khouang to clear fields and villages of unexploded ordinance. In 1987 MCC had two volunteers involved in projects in 11 of 16 provinces. Laos is a small, landlocked country in Southeast Asia. Mennonite Central Committee (MCC) placed its first representatives in the capital city of Vientiane in 1975. This was a time of uncertainty and transition, since Laos had just been through a major war and had suffered intense bombing by the United States. Early MCC assistance to Laos focused on increasing food production and helping displaced families resettle in their home villages. In 1981 MCC shifted its focus to village level, locally sustainable education and health programs. MCC also began working with officials of the heavily bombed province of Xieng Khouang to clear fields and villages of unexploded ordinance. In 1987 MCC had two volunteers involved in projects in 11 of 16 provinces. Stauffer, Brenda. "Laos." Global Anabaptist Mennonite Encyclopedia Online. 1987. Web. 25 Apr 2019. http://gameo.org/index.php?title=Laos&oldid=122070. Stauffer, Brenda. (1987). Laos. Global Anabaptist Mennonite Encyclopedia Online. 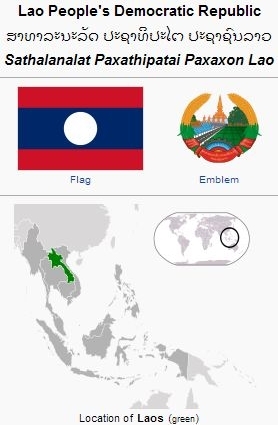 Retrieved 25 April 2019, from http://gameo.org/index.php?title=Laos&oldid=122070.